One of the most civilised Italian customs is their love of the late afternoon/early evening aperitif. Both in the Italian speaking part of southern Switzerland and in northern Italy at 5pm on the dot (sometimes 6pm depending on where you are) their version of “Happy Hour” begins. We found when staying there, however, that the emphasis was as much on the food as the drink (though it was admirably washed down with a glass or two of prosecco or pinot grigio). Aperitivos, as they are called in Italian, always constitute an opportunity for food and plates of olives, prosciutto, bruschetta and even small salads and grilled meats would appear along with our drinks. Although meant to be served as an appetiser before dinner, we felt quite full afterwards and almost skipped dinner altogether sometimes (but we couldn’t miss the opportunity of sampling more delicious food)! “Aperitivo Hour” is pleasant anywhere but one of the most memorable settings was on our last night in Italy on Lake Como. We were spending just 3 nights there to unwind before the long flight back home to Australia. 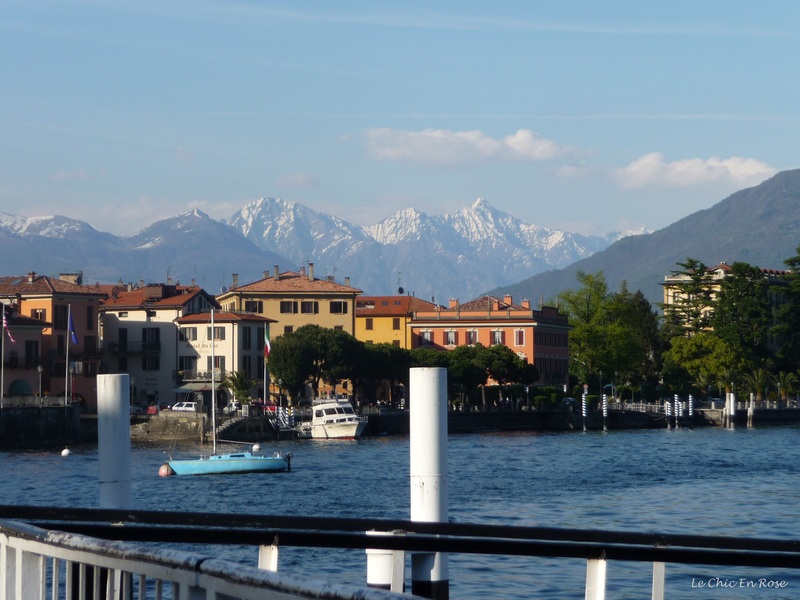 We’d caught the morning ferry from the quay at Piazza Cavour in Como City, where we were based and had spent a delightful day cruising up the lake towards Bellagio calling in at several pretty towns en route. After a very pleasant few hours lunching and wandering around Bellagio itself, we decided late in the afternoon to head across the lake to check out Menaggio before heading back to Como for the night. It was one of those fortunate decisions that will live on in our memories for a very long time. 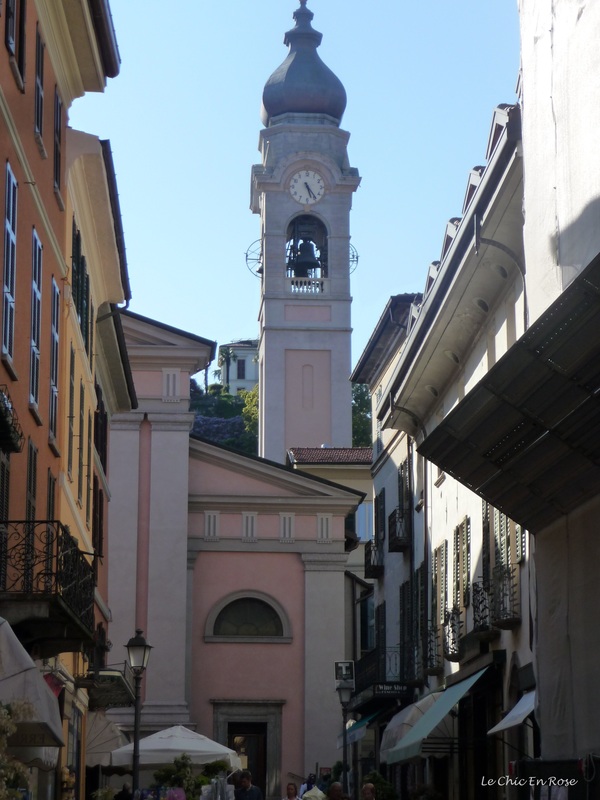 A few minutes leisurely stroll from the harbour found us in the heart of the old town in the Piazza Garibaldi. It’s not a big place and we were there before the start of the summer season so it wasn’t at all crowded. It had been a beautifully sunny spring day and locals and a few tourists were lingering in the piazza to admire the views and generally watch the world go by. It had such a relaxing and peaceful feel and above all no one seemed to be in a hurry. I decided to pop into one of the shops off the piazza to get some postcards and was mildly concerned when Monsieur Le Chic, who had taken himself off to explore, failed to reappear after a few minutes. Eventually 20 minutes or so later I spotted him emerging from the church at the top of the street. It turned out he’d gone inside to have a look round and found himself in the middle of a Latin Mass being conducted by an elderly nun. The congregation numbered only a handful and Monsieur Le Chic reduced the average age by about 30 years. Not wishing to be disrespectful he thought it best to stay a while before slipping away as quietly as possible out the back door. After that unexpected experience, it was definitely time for “Aperitivos” and so we settled down at one of the pretty table settings outside Hotel Du Lac to soak in the atmosphere and toast our last night on Lake Como. As its name suggests the Hotel Du Lac enjoys an excellent location at the lakeside end of the Piazza Garibaldi. We sat on our chairs looking out over the lake, which was softly highlighted by the early evening sun. It was simply idyllic! One notable feature was the family atmosphere around the square; elderly people chatted away, young children played as their parents watched on nearby and we didn’t feel hassled in any way. We began to wish we had stayed further up the lake rather than opting for the larger base of Como City. Transport with heavy baggage was a consideration although Menaggio is well served by not only ferries but plenty of buses too, which go all the way up the western side of the lake from Como towards Colico near the head of the lake. You can also get to Menaggio on the Bernina Express if you are coming from the direction of St Moritz in Switzerland and vice versa. 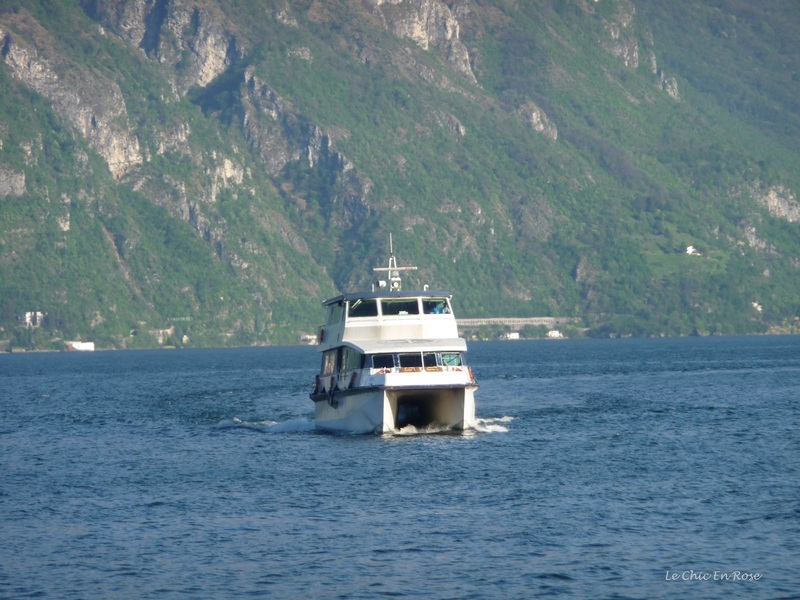 Menaggio is also linked to Lugano in southern Switzerland by buses but it may be more practical and comfortable to get the fast ferry back into Como and link up with the train (28 minutes to Lugano from Como San Giovanni Station and 40 minutes the other way to Milan). There is also another route via the Maloja Pass which connects St Moritz with Lake Como by both road and bus subject to seasonal timetable changes and weather conditions! Time was starting to slip away and we needed to get back to Como by nightfall. We wanted to catch the hydrofoil ferry as this halves the travel time (usually about 2 hours on the slower boats). We timed our departure just perfectly to give us the maximum amount of time to savour the experience at Hotel Du Lac and then with lingering glances and vows to come back one day, we boarded the boat for the trip back to Como. It looks stunning Rosemary – love the photos and especially those snowy peaks against the blue sky. Aperitivo hour sounds highly civilised – they should do that everywhere! Love the expansiveness of the first shot. I adore aperitivo in Italy! We’ve had some wonderful experiences but the most impressive are in Milan particularly down by the riverside. The only thing you need is mosquito spray! We have only grazed the edge of Lake Como and I’m keen to go back. So many wonderful photos! Thank you. Thanks very much to another Rosemary (Rosemary Kneipp) for including this post in her http://www.aussieinfrance.com/2014/10/weekly-blogger-round-up-aperitivo-in-italy-cycling-the-nantes-brest-canal-cruising-through-iceland/. Head over to Aussie In France for more details and to read about her life as an ex pat living in the Loire Valley (and until recently Paris)! Your photos are so beautiful! I went to Milan two years ago and didn’t fall in love with the city (I definitely prefer Florence), but the day trip I took to Lake Como was the highlight of the trip. And when I was there the weather was a bit overcast and drizzly. Your post reminds me of how much I would love to go back and spend more time there! Thanks Sara! Am so glad you like the photos! My only experience of Milan was trying to get to the airport so we didn’t really get to see the city in its best light and I was sad to be leaving Como too. I went to Florence years ago as a backpacker so would like to go back there one day as couldn’t afford to do very much the first time round. 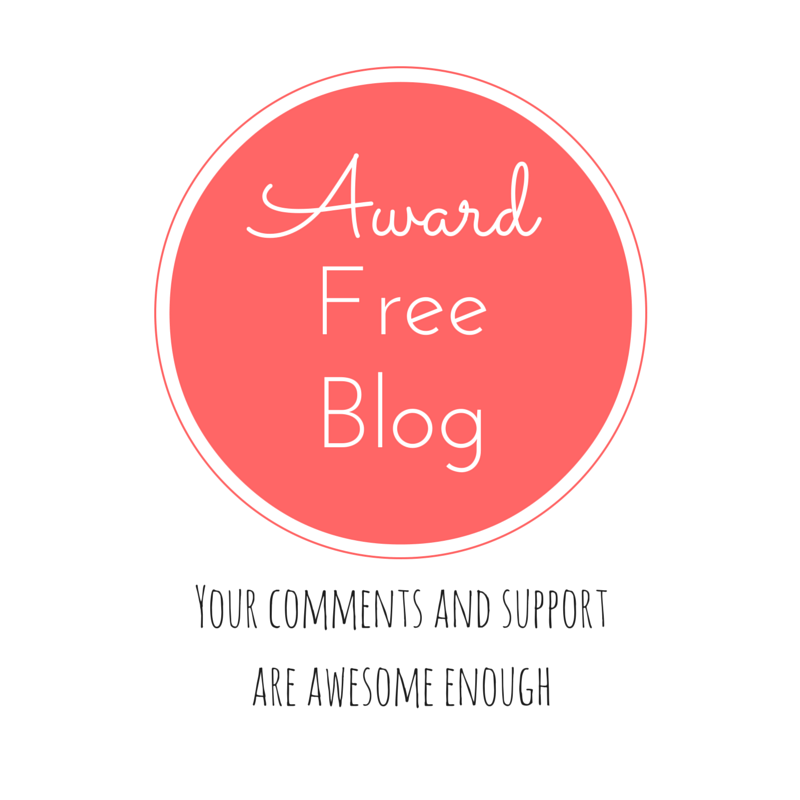 Your blog is so lovely and I’ll be a frequent visitor now I’ve found it! I love travel blogs as you can reminisce if you’ve been lucky enough to visit places, plan future travels as well or just admire other people’s wonderful photos and read about their experiences. Lake Como is definitely a place to go back to!